Do you have a toothache that is giving you serious pain? Or do you have a toothache that comes and goes but when it’s here, it is excruciating? Having a toothache can certainly make things difficult. At Black and Bass Cosmetic and Family Dentistry serving the Lansdale, Montgomeryville, North Penn and surrounding areas, we care about you and we want you feeling the best you can. If you have a toothache, we’d like to help. Perhaps you need a root canal. If so, we can give you a root canal procedure that can make that toothache disappear. Root canals are a procedure that once upon a time were considered rather unpleasant. However, with modern dental technology, your toothache may hurt worse than the procedure that eradicates it. To explain root canals, it’s best you know a little about teeth. When you had baby teeth, you had root pulp that helped your teeth grow. Now, with adult teeth, you still have root pulp but it’s unneeded. 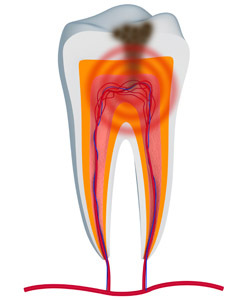 Sometimes that root pulp becomes infected and create a dental emergency. This is how you get a toothache and a root canal is what is needed to fix it. Our cosmetic dentist located near Montgomeryville and North Penn will numb your gums to prepare for the root canal. We are known for our painless injections. The dentist then removes the infected root pulp as the next step in the root canal procedure. Once the root pulp is removed, the Lansdale dentist will put some medicine in the space to keep any other infection from occurring and you will have less need for another root canal! The final step of the root canal is the dentist fills the space with the same tooth-colored filling material that is used to fill cavities. This tooth-colored filling is more attractive and healthier as it contains no metal. Root canals “finished” with this material look just like your natural teeth. Painful Toothache? Schedule a Root Canal in Lansdale Now! Root canals are a rather routine restorative dentistry procedure to treat cavities. Lansdale dentists, Dr. Black and Dr. Bass and our caring, well-trained team, are ready to give the people of North Penn, Montgomeryville and the surrounding communities root canals or whatever other treatment needed to help you feel and look your dental best. Call today!